Curious Table Cloth.—We had shown to us the other day a table cloth, which is the result of considerable skill, and no small amount of patience on the part of a soldier at present with the British forces in the Crimea. The cloth is composed entirely of pieces of woollen cloth, of various colours, cut into devices and diamonds, and neatly sewn together; in some instances embroidery being introduced. In the centre is a star, worked in gold thread, bordered by the rose, shamrock and thistle. 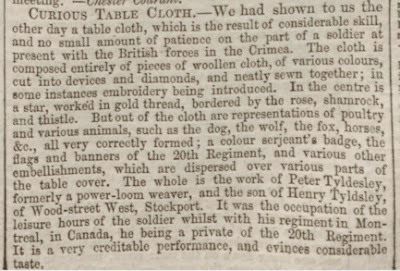 But out of the cloth are representations of poultry and various animals, such as the dog, the wolf, the fox, horses &c., all very correctly formed; a colour serjeant's badge, the flags and banners of the 20th Regiment [FN1], and various other embellishments, which are dispersed over various part of the table cover. 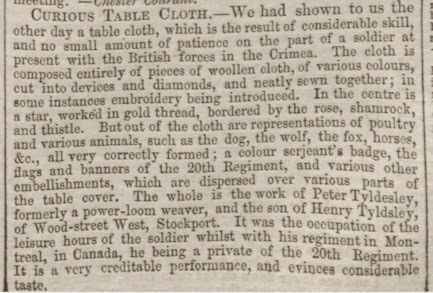 The whole is the work of Peter Tyldesley, formerly a power-loom weaver, and the son of Henry Tyldsley of Wood-street West, Stockport. It was the occupation of the leisure hours of the soldier whilst with his regiment in Montreal, in Canada, he being a private of the 20th Regiment. It is a very creditable performance, and evinces considerable taste. 1. Later the Lancashire Fusiliers, then the Royal Regiment of Fusiliers and now part of the Royal Regiment of Fusiliers.